Caesar salad is basic. Predictable. Boring, even. I mean, maybe you’ll find some well-seasoned chicken or delicious shrimp on a special Caesar, but generally it’s the same thing: romaine, Caesar dressing and Parmesan, mix well. Oh, and croutons. Repeat. But who says it has to be that way? 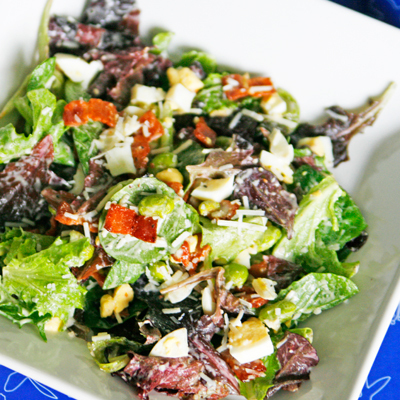 Who says that Caesar salads can’t be a little more exciting? Guess what? They can be. This one is. It’s all about the ingredients. While simplicity rules the classic Caesar salad, the details elevate this one. This version of the Caesar starts with baby lettuce — I use baby sweet lettuce, which is mild and pleasant. Next comes a chopped hard boiled egg. Just rough chop it into bigger pieces — no need to make it tiny. Also, I want to let you in on a little secret: If you are in a hurry, you can buy already hard boiled and peeled eggs. They’re perfect in a pinch. Or if you can’t seem to squeeze an extra second out of your day. Back to the salad. Next comes crispy bits of bacon and shelled edamame. But not just any shelled edamame — some that has been quickly heated in the bacon fat and then drained with the bacon. 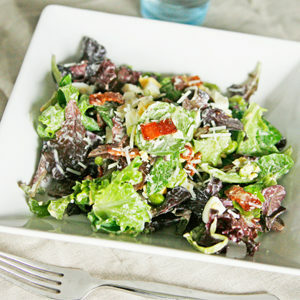 It makes it so special, and adds a little extra richness to the salad. You stir all of that together. Actually, it’s more like you toss all of that together. Finally it’s time to dress the salad. This is where the salad veers back toward tradition. 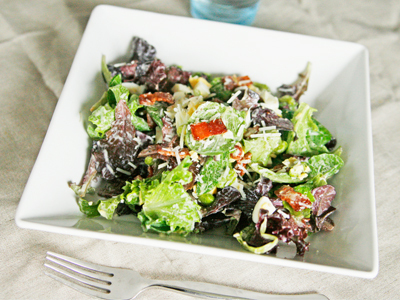 Use your favorite Caesar, whether it’s homemade Caesar salad dressing or store bought. Toss it. Sprinkle with some Romano. Toss again. Now, you’re ready to devour it. Also, did you see that mention of Eat. Live. Be. above? Cate, Patsy, Joanne and I put our heads together and decided to bring ELB back again. We need it, and we think some of you might need it too. Even though it’s the holiday season, we can’t wait to start moving toward our healthier selves again. If you aren’t familiar with Eat. Live. Be., it’s a healthy initiative that Cate and I started at the beginning of the year. We, with a group of great bloggers, posted on specific topics every Monday for until mid-summer. Along the way, a lot of us hit big milestones — like goals met and pounds lost. We’ve relaxed the rules for Eat. Live. Be. Reboot to focus solely on inspiration. We’ll be posting about things that inspire us every week from magazines, online, etc. I can tell you that the support and community of the original Eat. Live. Be. was incredible — and I have a feeling that it will be again this time. This week we’re talking about magazine inspiration. I really wasn’t sure what I would write about since I haven’t cracked open a magazine in too long. Though I have dozens of subscriptions, my time has been consumed by work and stress (which always leads to delays in getting work done). That’s one of the big things I want to change with this Reboot. I shouldn’t have been worried. I am a firm believer that life hands you just what you need right when you need it. I’d barely opened the latest issue of Bella Magazine when I saw an interview with Marisa Ramirez, an actress who played Gia on General Hospital. Turns out Ramirez is big into fitness — particularly kick-boxing, which she teaches when she isn’t off filming something fabulous. The interview focused on Ramirez’s attitude about fitness, her inspirations and how she stays healthy when she’s so busy (didn’t I tell you that it was just what I needed?). She’s so devoted to being healthy and living a fit life. That’s exactly what I want for myself. “The key is to do everything in moderation. Set goals for yourself and keep increasing them. Some people love to make excuses for why they are not working out or eating well. Once you’ve tried it, you will start feeling happier and better about yourself,” Ramirez told Bella. Be sure to pop in on the Eat. Live. Be. Reboot Facebook Page to see what everyone is up to. We’ll be posting little updates and tips throughout the week there too. In the meantime, enjoy this salad. Heat a small skillet over medium heat. Once it's hot, add the bacon. When it's almost done (mostly browned), add the edamame to the pan and cook for 1 minute, or until the bacon is done. Pour onto a paper towel-lined plate and let drain. 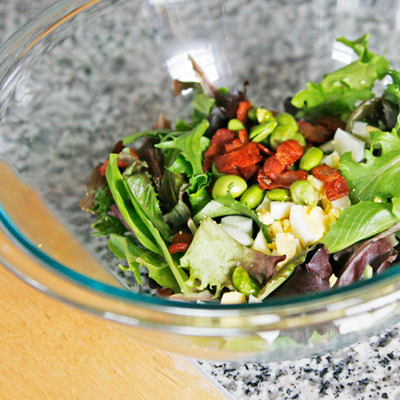 In a medium mixing bowl, add the lettuce, chopped egg, bacon and edamame. Stir well. Add the Caesar dressing and toss well to combine. Sprinkle with cheese and toss again. 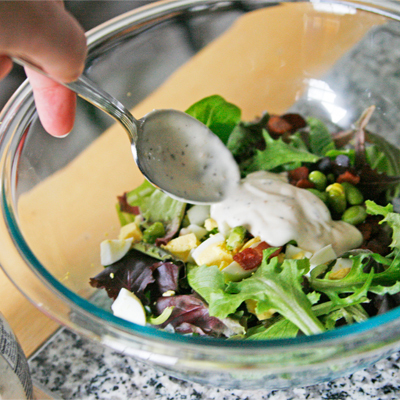 Transfer the salad to a plate or large bowl. Woot woot to the eat.live.be. reboot kick-off! 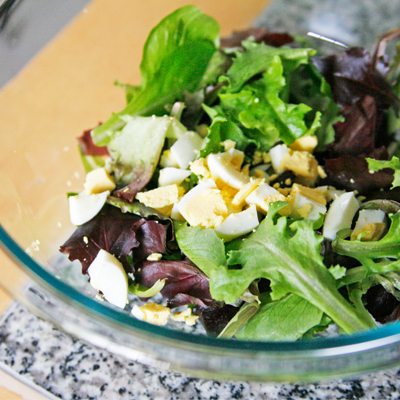 This salad looks like the perfect way to start, proving that healthy foods are NOT boring! I love that quote and it’s so true. Every time I overdo it on the sugar, I feel so gross and tired the next day…but when I’m good with exercise and eating, I’m alert and ready for action. Definitely need to remember that! This is a wonderful project, I’ll join you! Thank you for reminding me that sleeping more should be a specific goal. Sleep always gets moved to last place, doesn’t it? love the suggestion to set goals and keep increasing them… something to keep in mind as I continue on the Eat. Live. Be. Reboot! That salad looks amazing – one of my favorites. I haven’t hard a Caeaser salad in a while. And hubby loves them. Sounds like it’s time! I’m jumping in on the bandwagon. Love this twist on Caesar! I probably eat Caeser salad more than anything. Love this different take on it. Thanks.